Do you believe in the power of hypnosis and metaphysical/alternative suggestion? 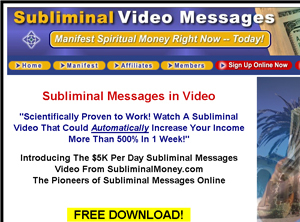 Then check out Subliminal Money to help find a clearer path towards financial success! Basically, the video will help to put your heart and mind ‘in sync’ and help you to ‘believe’ you can do it, so you can move ahead and tackle projects with a degree of ‘surety’ you’ve never experienced before. The website offers a free download to sample the video, but a price and sign-up link are not available. If this sounds like an offer that might interest you, please click on this link http://www.subliminalmoney.com/ and check out the website.